We’re celebrating Zombie Week here at Last Kiss, so I couldn’t resist posting this pic from ZomBcon 2011. I bopped into the show briefly last weekend to see what a convention full of zombies was like. Well, it’s a lot like a political convention–except with more Braaains! And way cooler outfits. I stopped to chat with www.geekchicdaily.com/ Editor-in-Chief Brian Walton (see photo above) and decided to take his picture. 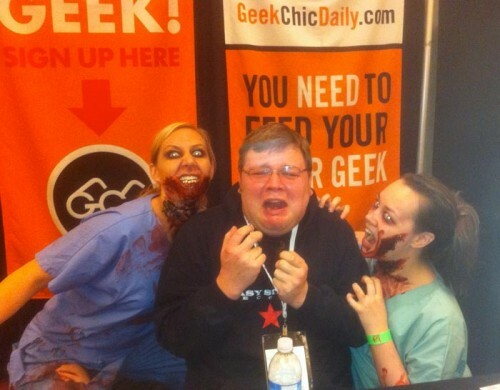 Two zombie gals immediately volunteered to make the photo more…uh, interesting. Yeah, it was that sort of convention!